The Shed of the Year Competition 2014! 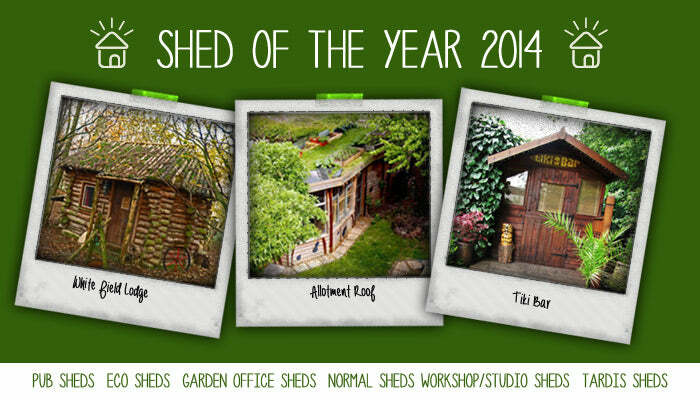 The images and information for this article can be found here> The Shed of the Year 2014 finalists have been announced! This competition brings together the best sheds from around the UK and for the first time EVER will be aired in a new Channel 4 three part TV series titled ‘Amazing Spaces Shed of the Year’. The first part of this TV series will be aired on the 24th of July at 8pm and will be hosted by George Clarke and the competitions founder Uncle Wilco from Shed Blog. The competition is as popular as ever this year with a record breaking 20’000 public votes; a 73% increase on last year. This competition was originally set up by Uncle Wilco from Wales who launched the competition to showcase the best of British sheds. The winner will receive £1000, £100 worth of Cuprinol products and a giant crown for a shed courtesy of competition sponsors Cuprinol. Here at Walton’s we love to see our buildings and other sheds transformed into pubs, clubs, studios, gyms, cinemas and much more! We love ‘The Shed of the Year’ competition so we’ve put together a list of our favourite shed from each category. There’s no better feeling then strolling into a pub on Friday night; well apart from if that pub is at the end of your garden! No need to take a taxi, home comforts a few steps away and no queue for the bogs! The ‘Pub Shed’ category is the most popular in the Walton’s office; what a great way to make the most of a wooden shed at the end of your garden. A pub shed is the ideal way of creating an entertainment space at home without losing space in your home. It can be a great escape from a busy household and perfect for entertaining guests in your very own garden. Pub sheds come in all shapes, sizes and styles; some are traditional others are modern. A pub shed can be made in almost any style! Creativity is key. This unique shed will make you feel like you’re soaking up the rays on a beach but it’s at the end of Stephen’s garden! The Tiki Bar is a tropical hideaway where yummy, coconut flavoured cocktails can be sipped all year round even when it’s chucking it down outside. This bar features LED lights which add a party feel and hand carved coconut cups! The inside and outside of this shed also features examples of Stephen’s exceptional wood carving skills. This tropical bar was designed and built by Stephen Lodge, who was inspired after years of travelling the globe chasing those perfect surfing spots. Stephen still works on the bar and created the unique bar top himself. Take a look at Stephen’s site for more information about the bar and how it was created. The world we live in has changed dramatically and our modern lifestyles have a huge impact on the environment around us. The Eco Shed category brings together sheds that incorporate recycling or an environmental feel. This year the category is full of unusual and stylish buildings made from recycled or upcycled materials. This category provides shed owners with lots of inspiration for our own sheds. Adding a living roof to your building is not only great for wildlife but can be beneficial to the sheds interior too. Living roofs and natural insulation can provide lots of warmth for a shed, summerhouse or log cabin all year round. The first major feature of this shed is obviously its living roof! The owner of this shed was very tight for space so decided to put an allotment on his shed roof. The actual interior of the shed is used as part art studio and part music room. The roof of this shed provides lots of growing space and grows courgettes, carrots, broad beans, garlic and much more! This shed is also sustainable in many other ways. The lights inside are solar powered and the interior is heated by a wood burner. The roof of the shed also collects water which is then used to water the herb garden. A living roof is a great way of making your shed stand out and also provides a great home for insects and wildlife. We love this sustainable shed and it must be great working in a studio and knowing you are helping your surrounding environment. More and more of us are now taking the plunge and opting to work from home; but the practicalities of this can be very complicated. Separating work and home life can be difficult sometimes but by having your office out of the house it can make a world of difference. An outside office space is also necessary if you need to have meetings with clients; don’t drag them through your home; just walk them to your nice new office. Garden offices come in all shapes, sizes and styles. Adding electricity to the buildings transforms them from outdoor wooden buildings to modern tech hubs ideal for any type of business. A layer of insulation also helps make the office comfortable to use all year round. Our favourite in this category has to be the ‘Thatched Cottage’; this stunning and unusual garden building was originally constructed to be a store for tools and a small office. The small cottage style building compliments the original 16th C cottage perfectly. The thatch on this garden building does not just add to its overall look but also helps keep the building warm in winter and cool in summer. After having children the couple who own this stunning building decided to add something special for their two girls. Living in a cottage is cosy but not very practical for bunk beds; after many pleas from their daughters the couple then decided to add bunk beds to this cosy garden room. The bunk beds provide a great place for the children to have sleepovers. The bunk beds are also very practical; they fold down easily so the outside room can still be used as an office for meetings. A summerhouse is a great addition to any garden providing a space to relax and enjoy your outdoor space. Summerhouses can also be used as gyms, second living rooms, cinema rooms and much more! Traditional summerhouses have always been popular in the UK but now there are also a lot of modern summerhouses available. A wooden summerhouse is a great blank canvas to decorate and transform. This year the category is full of interesting buildings and shows how versatile a summerhouse can be. If you want to add space to your home a summerhouse can be a great alternative to a brick built extension and often does not require planning permission. This summerhouse caught our eye straight away; we love the colour used to paint the outside of this building. This summerhouse was painted with Cuprinol Seagrass on the outside which has totally transformed it’s look from the very traditional to a unique garden building. Inside this summerhouse is painted in a deep orange colour and the ceiling is draped with purple voile giving the interior a very Moroccan theme. Inside the summerhouse furniture and accessories really add to the overall feel of this building. It features a small water feature, a hummingbird, a red velvet rocking chair and much more. The perfect getaway from a hectic life! The eclectic selection inside the summerhouse has been sourced from eBay and fabric shops. On the summerhouses’ porch there are also orange honeysuckle and more plants. It could be argued that all the sheds in this competition are unique but these sheds are totally and completely unique!! This category is where you can let your imagination run wild. If you can think it and build it this category is for you. In the past we've seen the mad and the wild including a pirate ship shed! You don’t have to be a master carpenter to create your own unique shed. It’s all about getting your image on to a blank canvas; why not a shed?! Paint and add-ons can easily turn any shed into a masterpiece. The Tea Pot Shed definitely stands out from all the entrants this year. This large shed is shaped like a tea pot and has a useable interior. Its stunning green colour really makes it stand out and it really does look like a tea pot. This large shed measures 21ft in diameter and has two internal levels. The bottom of the shed can be used to dry wood and the top can be used as a summerhouse. The steps between each level can be found in this shed’s handle! This shed is made from many recycled materials; the framework for the shed is made from 12 recycled telegraph poles. The dome shape at the top of the teapot is made from old poly tunnel tubing and the shed’s cladding is made from curved cuts of timber sourced from a nearby mill. The top of the teapot is made from an old fishing buoy and can be opened during those hot summer nights. We think this shed is a real winner and is one of the most unique buildings we've ever seen! This category showcases the best normal sheds which are transformed into almost anything; a gym, a restaurant or even a disco! Normal sheds can be used for garden storage but they also provide a blank canvas to transform into whatever your imagination can think of! Sheds are ideal if you want a hideaway from your home or just a quiet place to sit and enjoy a cup of coffee. The benefit of using a normal shed is that they are easier to construct and modify. You don’t have to think about structures just simply add to your building. We've heard of sheds being turned into space observatories and much more. Garden sheds come in many different shapes and sizes; so you can find one to fit almost any garden or outdoor space. In 2009 the Disco Shed 1 made it to the Shed of the Year final but owners Paddy Bickerton and Aidan Larkin have comeback with a caravan-chassis mounted Disco Shed...introducing version 2! Paddy and Aidan travel around the UK’s largest festivals spreading ‘Shedonism’ among all the party goers they meet! The Disco Shed has travelled to countless events and festivals around the UK including T in the Park, Big Chill, Camp Bestival, Reading, Leeds, Shambala and many more. Look out for this fun filled shed next time you’re at an event of festival. This shed contains everything you need to entertain a field full of revellers including DJ decks, lights, The World Famous Disco Shed inferno smoke machine, a record sleeve lined roof, bad jokes and two men looking spread shed love all over the land. Well done chaps! This category is for any sheds or workshops which are being used as a workshop. The garden can be the perfect place for an art or music studio; the garden is quiet and is away from your home. Hectic homes can sometimes block imagination so why not create a studio at the end of your garden where you can relax and be creative. Sheds and summerhouses can easily be turned into a studio; they come in all shapes and sizes so can fit in most outdoor spaces and gardens. Some artists even use Log Cabins and Summerhouses into galleries or shops to sell homemade masterpieces. You may recognise this shed is you’re a Shed of the Year fan; it was entered in this same category in 2012 and now it’s back with some new features. This shed is home to Syd (Luke Hollingworth) who is a rural based street and field artist. This shed is purpose built to house aerosol graffiti art adventures and of course some relaxing too. The ‘Stencil Shed’ can be found at the end of a well presented garden and is designed to be an optical illusion so it’s own face looks back to you. The roof of this shed also features a green roof; with sedums, grasses and a tree growing on the roof. The living roof ensures any floor space lost has been replaced and also helps keep the interior of the shed warm in the winter and cool in the summer. The shed interior is filled with artworks and in the winter a wood burner helps keep the interior warm. The shed also has a 400w stereo system so it can pump out beats too. The TV Show ‘Dr Who’ is a worldwide success with fans spanning countries, ages and languages. The show’s popularity continues to grow and grow and what better way to pay tribute to your favourite show than building a new shed! The Tardis is not just for the Dr any more, it can easily be added to any garden. This impressive Tardis Shed was definitely a favourite in the Waltons office! This stunning shed was built to scale for an 8 year old Dr Who fan. This shed was built entirely from scratch and with only basic drawings found on the internet. The inside of the shed also features halogen spotlights for each light box and even the classic blue light for the Tardis roof.